If this doesn’t cause the people who attend Hillsong to ask questions of these bullies then they should hang their heads in shame. 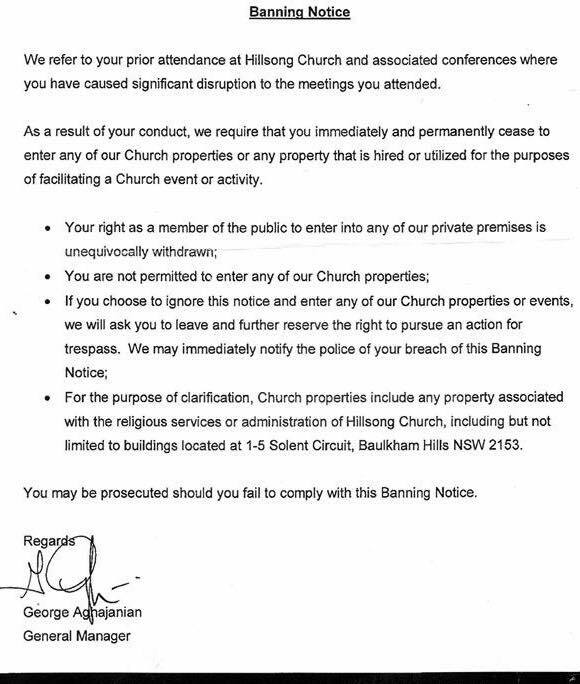 Regardless of who is right, or wrong or thinks who did what to whom, this is NOT a letter that should be sent by a Christian church to ANYONE. How dare these bullies continue with this disgraceful behaviour. I ask only one question “Would Christ have done this?” Whatever happened to a letter like “Tanya, we are in disagreement about certain things. We invite you to attend a meeting with us to discuss our differences and try to sort them out in the spirit of Christian love and understanding – and prayer!” Wake up Mr. Houston and stop behaving like a spoiled schoolboy. And as for you Mr. Agajanian, you are a total disgrace and no Christian church should even consider having you anywhere near their church until you repent of your disgraceful treatment of people and your “Mafia” like tactics. Grow up you guys and start to behave like MEN – CHRISTIAN MEN! And wake up members of Hillsong and stop following these men blindly and idolising your leader instead of following Christ! I am sickened by this disgraceful letter. Where in the Bible does it say men should behave like this towards women – I don’t care what Houston says – WHERE IN THE BIBLE DOES IT SAY IT IS OKAY!!!! Tanya Levin is just one person. Why are Hillsong so threatened by her? Because they’re insecure. Because they don’t have the Holy Spirit, the O so Sweet Spirit of Jesus. Because they’re run by despots and bullies like Brian and Bobby Houston. Because they can’t take criticism. Because they think they’re perfect. Because they’re arrogant. Who’d want to go there anyway? Tanya is O so fortunate and blessed she’s been black-banned. It’s a life sentence not to attend a House of Charlatans, Con-artists and Greedy people, who are full of avarice and pride. Shake the dust off your feet Tanya. Rejoice that you’ve been black-banned by Hillsong. Wear it like a badge of honour. Exactly. Imagine a minority of pastors standing against and exposing Hillsong’s lies? 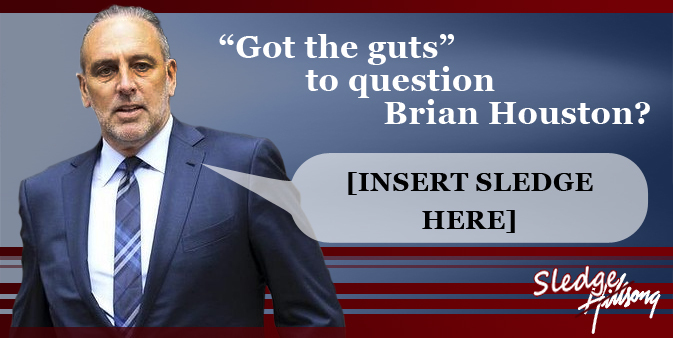 Oh wait – they are, Brian Houston fell apart and was exposed as a liar. Imagine a minority of journalists standing against and exposing Hillsong’s lies? Oh wait – they are. Brian Houston fell apart and was exposed as a liar. Imagine a minority of victims standing against and exposing Hillsong’s lies? Oh wait – they did and Brian Houston took the stand at the Royal Commission and was exposed as a liar. So imagine if the actual visible church of Australia actually heeded Jesus’ Words to watch out and expose false prophets and their schemes? Perhaps that’s what we need churchwatcher – a systematic media campaign that exposes ALL of Hill$ong’s lies, shabby treatment of its members past and present, and a very thorough investigation by the ATO. I found an onine story about the Agape doomsday cult (which admittedly was into extremism – weapons handling, survivalism, radical recrutment methods, communal living, various abuses) but the point is, a SA judge found them guilty of certain crimes and the ATO sent them a bill for $3 million. That’s what can happen if a court determines that a “church” is not a ‘church’ and is in fact, a cult – they are stripped of their tax free charitable status, receivers are appointed to dispose of assets and the ATO takes the bulk of what’s left.